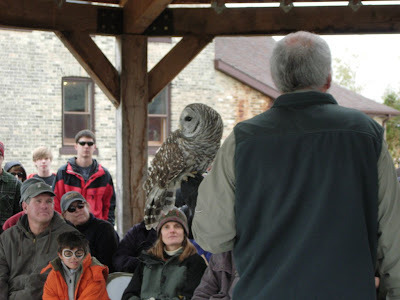 Woodland Dunes Nature Center in Two Rivers, WI held their annual "OWL FEST" today. Steve and Evie Fisher made the long trek to Two Rivers last night taking 4 owl species, a Barred Owl, Great-horned Owl, Gray Phase Screech Owl and Red Phase Screech Owl with them as well as a Juliet our Red-tailed Hawk. 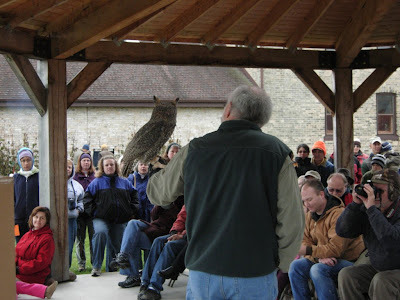 While the programs was all about owls, it is also all about environmental education. 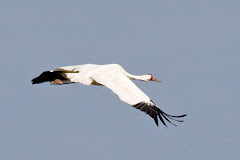 Adding the unexpected hawk to the mix underscores the difference between the types of raptors. Over 400 people attended the event this year. We love the opportunity to teach the public about the world around them. 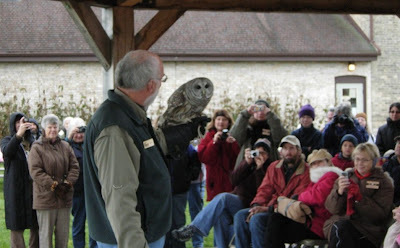 October, the season of Halloween and the Harvest Moon makes teaching about owls especially fun. 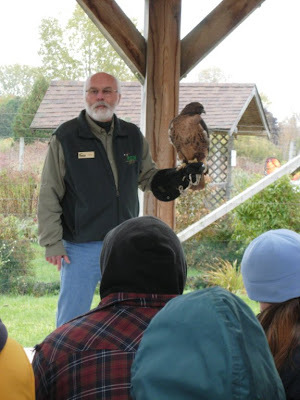 Thanks to the Woodland Dunes Nature Center and the fine people of Two Rivers for inviting us.